Skinn by Dimitri James is a "new to me" line, and although I have heard of the brand, I really knew nothing about the line or the man behind it. Mr. James is a professional makeup artist who launched Skinn in 2002, after becoming disillusioned by the way larger cosmetics houses created and marketed products. Skinn carries a growing range of skin care treatments and color cosmetics, and they are manufactured in the U.S.A. (California). You can read more about Dimitri James in his bio here. I'm a little bit of a skin care freak, so I was excited to try out some of their products. The first two items I began using, which I'll be reviewing today, impressed me so much, that I placed a large order for more of their skin care products and some of their color cosmetics using a 10% off code that Skinn posted on Twitter. You can also find current offers and specials on their Facebook page. I'm still working my way through lots of products, so there will be more reviews to come. Skin care products are more time consuming to review, and their results are often relative to specific characteristics of the person reviewing them. By that, I mean their age, skin type, and genetics. These all play a big part in the type of skin we have, so if a product works for one person and does nothing for another, it's not necessarily that the product itself doesn't work. Of course, I have used plenty of products that just don't seem to do much of anything for anyone, no matter what their overall skin picture is! I always have to chuckle to myself when I read reviews from ladies in their early 20's that give a wrinkle treatment a low rating because it didn't seem to do much for them, and I always wonder how bad can their wrinkles be at that age? Then there are the reviews I read that disqualify a product's effectiveness because they used it for a day or two and didn't notice a difference. For the sake of talking about these products as they relate to my particular skin situation, I have combination skin, pores that are noticeable on my nose area and just slightly beyond, and because I'm 53, the typical signs of aging have definitely arrived. I would say that my top skin concerns at this point in my life are pores that I would like to dimish the size of, wrinkles, loss of elasticity, dark circles around my eye area, and the sun spots that are starting to appear. Lots of skin concerns, I know. As I mentioned, many skin care products can take a while before their full results are revealed, but these two particular products from Skinn gave me instant results. As time goes by, those results continue to improve the areas of my skin that they focus on. Pure Pore Hydro-Enzymatic Deep Pore Cleanser $18.00/2.0 oz. I apply this to my nose and inner cheek area after cleansing. I leave it on for about a minute, and then add some warm water to it and massage the targeted area, and rinse. The first time I used this, I noticed small white flake-like particles on my nose when I got out of the shower. I wasn't sure exactly what they were, but upon closer examination, I realized it was sebaceous filaments/plugs of subum...that sounds so disgusting, doesn't it?!! But that made me realize how well this product was working right away. I've been using this a couple of times a week now for several months, and my pores look clearer and significantly smaller. I don't need to use a lot of product, probably less than a pea-sized portion with each use. This comes in a little plastic flip-top style bottle, and the formula is a fairly thick liquid. Description: An anhydrous formula loaded with enzymes, minerals, prebiotics and salicylic acid to gently rid the skin of dirt, debris and dead skin cells, while cleansing deep inside the pores without irritating the skin. As an added feature, this cleanser warms up upon application with the addition of water for a deeper pore cleansing experience. Directions: Apply to wet skin after cleansing as needed on congested areas. Apply with plenty of warm water to maximize effectiveness. Best if used with SkinnSonic in extraction mode, or use your fingers and massage as desired. Rinse off with warm water. Ingredients: glycerin, propylene glycol, disodium lauryl sulfosuccinate, sodium C14-16 olefin sulfonate, lauramidopropyl betaine, zeolite, protein enzymes, salicylic acid, alpha-glucan oligosaccharide, hydroxypropyl guar, xanthum gum, phenoxyethanol, caprylyl glycol, chlorphenesin, titanium dioxide. I am always looking for something to use on my eye area that will smooth them out, and this product is perfect for that. My eye area isn't particularly dry, but there are wrinkles and creases that most eye creams haven't done as much as I would like them to for this problem. I use this sometimes before, or sometimes after my eye cream, and also as a touch up right over my make up later in the day. Again, this product gives me instant results. The lines under my eyes are reduced by I would say 50% or better, and the "crinkling" that is developing on my upper eye lid is also reduced, although this area seems to be more stubborn and I'm not seeing quite as much of a reduction in the wrinkles here as I am under the eye area. It comes in a wand much like a lip gloss, and it has a doe-foot applicator. Just a dab of product is all that I need, and then I gently tap and spread it out over the area as needed. It's a thin formula, so it applies easily and doesn't disturb my make up if I'm applying it later in the day. Description: The skin around the eyes is dry and thin and when make-up, concealors and powders are applied the under-eye area can look even drier and "crinkled". This amazing little wand contains the solution. Our special decrinkling complex smoothes out the look of dry lines and firms the skin for a super smooth look all day. Directions: Apply daily in a patting motion to the eyelid and under eye area until desired brightness and coverage is achieved. 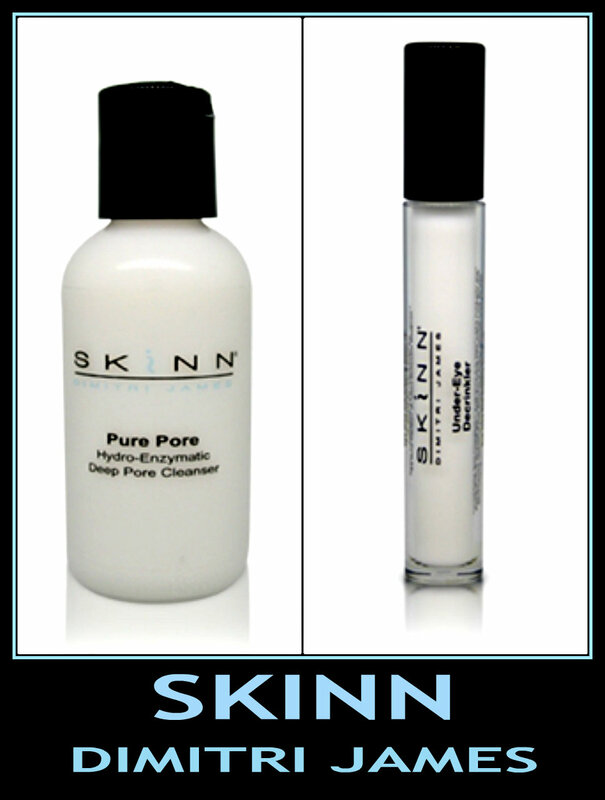 Skinn products are available on their web site here, and also at Shop NBC, The Shopping Channel, and TVSN. You can view the schedule for those programs here. I ordered directly from their web site and the shipping was very fast. They also offer free shipping over $50.00 and are currently offering 12% off on all orders using the code WINTER12. They carry a wide variety of skin care products, color cosmetics, make up brushes and more.